Objectives: Persistent secondary hyperparathyroidism is common after successful kidney transplant, with concomitant hypercalcemia and hypophosphatemia potentially leading to reduced graft survival and increased cardiovascular risk. Cinacalcet, a calcimimetic agent that activates the calcium-sensing receptors in parathyroid glands, is a therapeutic option. In this study, we assessed the long-term treatment effects of cinacalcet for a period of up to 5 years in a cohort of kidney transplant recipients. Materials and Methods: Forty-seven patients with secondary hyperparathyroidism (intact parathyroid hormone level > 70 pg/mL or 7.43 pmol/L) and hypercalcemia (corrected calcium > 10.4 mg/dL or 2.6 mmol/L) were considered eligible for treatment with cinacalcet and were included in the analysis. Data were recorded at initiation of treatment and every 6 months up to a maximum follow-up of 60 months. A control group of patients treated with placebo, conventional treatment, or surgical treatment was not available for this study. Results: Mean follow-up time was 45 ± 16 months. Treatment with cinacalcet was initiated at a median of 25 months after renal transplant. Serum calcium decreased by 0.21 mmol/L (2.69 vs 2.48 mmol/L; 95% confidence interval, 0.08-0.345; P < .001) during the first 6 months, and this reduction was sustained during follow-up. Intact parathyroid hormone level decreased by 7.68 pmol/L (32.96 ± 36.4 vs 25.28 ± 19.5 pmol/L; 95% confidence interval, -6.42 to 21.75; P = not significant) at 6 months, whereas at the end of follow-up intact parathyroid hormone level decreased further by 20.07 pmol/L (32.96 ± 36.4 vs 12.89 ± 5.73 pmol/L; 95% confidence interval, 2.02-38.1; P < .01). 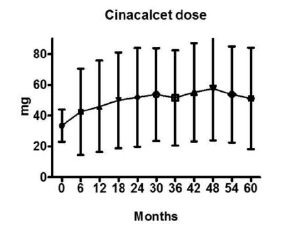 Mean starting dose of cinacalcet was 33.5 ± 10 mg/day. According to the therapeutic response, cinacalcet dose increased steadily and reached 51.1 ± 33 mg/day at the end of the observation period. Mean serum phosp-horus increased significantly, whereas estimated glomerular filtration rate remained virtually stable throughout follow-up. Adverse reactions were observed in 4 patients, comprising mild gastro-intestinal complaints. Conclusions: Long-term treatment with cinacalcet in kidney transplant recipients with secondary hyperparathyroidism is effective in controlling hypercalcemia and correcting hypophosphatemia, without affecting graft function while being well-tolerated. Cinacalcet is a calcimimetic drug that allos-terically activates the calcium-sensing receptor expressed on the surface of the chief cells of the parathyroid gland. Calcium-sensing receptor activation inhibits PTH secretion and leads to a decrease in serum calcium.13,14 Cinacalcet has not been officially approved for use in kidney transplant recipients with persistent secondary hyperparathyroidism, although it has been used off-label in an effort to improve hypercalcemia and avoid parathyroidectomy. However, its efficacy in this group of patients remains under investigation. In the present study, we prospectively assessed the long-term treatment effects of cinacalcet in kidney transplant recipients with persistent second-ary hyperparathyroidism and hypercalcemia, followed for a period of up to 5 years. This was a prospective single-center study. Adult patients (> 18 years) who received a deceased-donor kidney allograft from January 2008 through December 2014 and who commenced treatment with cinacalcet due to secondary hyperparathyroidism and hypercalcemia were considered eligible for participation in the study. Exclusion criteria were estimated glomerular filtration rate (eGFR) at initiation of treatment of < 20 mL/min/1.73 m2 and refusal to provide informed consent. Over the study period, we followed 362 patients in the outpatient transplant clinic. Fifty-two patients met the inclusion criteria and provided informed consent. Of these, 3 patients were excluded from the study: 1 because of diagnosis of pancreatic cancer 2 months after commencement of cinacalcet and 2 because of consent withdrawal at 2 and 4 months after initiation of treatment. Of the 49 patients included in the study, 2 more patients were lost to follow-up before their 12-month scheduled visit and were excluded from the analysis. Finally, 47 patients were included in the analysis. Data were recorded at initiation of treatment with cinacalcet and every 6 months until a maximum follow-up of 60 months. Although recruitment stopped at the end of 2014, data collection continued for another year (until end of 2015). The study protocol was approved by our Local Ethics Committee on human research and was in accordance with the Helsinki Declaration, as revised in 2000. Hyperparathyroidism was defined as intact PTH (iPTH) of > 7.43 pmol/L (70 pg/mL). Hypercalcemia was defined as serum calcium corrected for serum albumin > 2.6 mmol/L (10.4 mg/dL). Hypercalcemia persisting for more than 3 months despite review of medications was considered as an indication for treatment with cinacalcet. The following data were recorded at initiation of treatment and at each scheduled visit thereafter: serum iPTH, calcium, phosphate, albumin, alkaline phosphatase, creatinine, eGFR (Modification of Diet in Renal Disease), cinacalcet dose, calcineurin inhibitor trough levels, and 24-hour urinary protein excretion. Continuous variables were reported as means, standard deviations (SD), and range of values as appropriate. Changes of examined values from baseline were evaluated using repeated-measures analysis of variance (ANOVA) or one-way ANOVA as appropriate. Comparisons of changes in serum iPTH, calcium, and phosphorus concen-trations between subgroups of patients were performed using t test or Mann-Whitney U test as appropriate. Statistical analyses were performed with GraphPad software 5.03 (GraphPad, La Jolla, CA, USA). Clinical and demographic data of study patients are summarized in Table 1. Mean follow-up time was 45 ± 16 months (range, 12-60 mo), with 21 patients having 60 months of follow-up. Cinacalcet treatment was initiated at a median of 25 months after renal transplant, with 12 patients starting cinacalcet during the early posttransplant period (up to 30 days after surgery). All patients received an immunosuppressive regimen consisting of a calcineurin inhibitor (tacrolimus or cyclosporine in 24 and 23 patients, respectively), plus mycophenolate mofetil, or mycophenolic acid and corticosteroids. At baseline, none of the patients received active vitamin D or analogs. Nevertheless, 8 patients received alfacalcidol, in addition to cinacalcet, during their follow-up. In these patients, alfacalcidol was started 24 months (range, 6-54 mo) after initiation of treatment with cinacalcet. Median dose of alfacalcidol was 0.25 μg (range, 0.125-0.5 μg), and median duration of treatment was 12 months (range, 6-36 mo). Two patients were receiving alfacalcidol at the end of follow-up (60 months), whereas in the remaining 6 patients, alfacalcidol was stopped because of recurrence of hypercalcemia. No patients received calcium salt-prescribed therapy at any point of follow-up. Serum calcium decreased by 0.21 mmol/L (2.69 ± 0.14 vs 2.48 ± 0.23 mmol/L; 95% confidence interval [CI], 0.08-0.345; P < .001) during the first 6 months; during the remainder of follow-up, the reduction reached a maximum of 0.41 mmol/L (2.69 ± 0.14 vs 2.28 ± 0.19 mmol/L; 95% CI, 0.255-0.568; P < .001) at 54 months after initiation of treatment (Table 2). The cinacalcet-induced calcium reduction was sustained during the entire follow-up (Figure 1A). Serum iPTH decreased by 7.68 pmol/L (32.96 ± 36.4 vs 25.28 ± 19.5 pmol/L; 95% CI, -6.42 to 21.75; P = not significant) at 6 months, whereas, at the end of follow-up (60 months), iPTH decreased further, reaching a reduction of 20.07 pmol/L (32.96 ± 36.4 vs 12.89 ± 5.73 pmol/L; 95% CI, 2.02-38.1; P < .01) (Figure 1B). When patients were grouped by baseline eGFR (of more or less than 60 mL/min/1.73 m2), although iPTH at 6 months after the initiation of cinacalcet decreased in both groups, this decrease reached significance only in patients with eGFR < 60 mL/min/1.73 m2 (30.03 vs 22.6 pmol/L; P = .04). In contrast, serum calcium was significantly decreased in both groups, whereas serum phos-phorus was increased (data not shown). Patients received a daily mean starting dose of 33.5 ± 10 mg of cinacalcet (range, 15-60 mg). According to the therapeutic response (serum calcium and iPTH levels), cinacalcet dose increased steadily, reaching a maximum mean dose of 57.7 ± 33 mg (range, 15-150 mg) at 48 months of follow-up (P < .05). At the end of the observation period, mean cinacalcet dose remained at 51.1 ± 33 mg (range, 15-150 mg). Dose adjustments were necessary early after initiation of treatment in a clearly upward manner to achieve calcium reduction toward normal levels (Figure 2). Most importantly, although normal serum calcium concentration (2.38 ± 0.185 mmol/L) had already been achieved 12 months after initiation of cinacalcet, its dose had to be increased further after that time point (Figure 2). The clinical significance of this observation was that, to maintain a normal serum calcium concentration, a constant cinacalcet upward titration was needed. Mean serum phosphorus concentration showed a gradual, significant increase after the initiation of cinacalcet, which remained until the end of follow-up (ANOVA, P < .01) (Figure 1C). Mean phosphorus concentration peaked at month 54 (0.93 ± 0.26 vs 1.107 ± 0.21 mmol/L; P < .05), which coincided with a nadir in mean calcium concentration (2.28 ± 0.19 mmol/L). Serum alkaline phosphatase showed a lowering trend from a mean concentration of 1648 ± 146 μkat/L (range, 0.46-10.03 μkat/L) at the initiation of treatment to 1309 ± 0.43 μkat/L (range, 0.66-2.24 μkat/L) at 60 months, which did not reach statistical significance. Estimated glomerular filtration rate remained virtually stable throughout follow-up. It showed a nonsignificant increase (48.3 ± 21 vs 54.6 ± 17 mL/min/1.72 m2; P = not significant) at 6 months after the initiation of treatment. At the end of the 60-month observation period, it reached 47.2 ± 15 mL/min/1.72 m2, indicating the safety profile of the drug in renal transplant recipients at least as far it concerned long-term graft function. Proteinuria decreased 6 months after the initiation of treatment (222 vs 158 mg/24 h, P = not significant), and remained at lower levels compared with the starting values for 18 months (222 vs 187 mg/24 h; P = not significant). Thereafter, a gradual, nonstatistically significant increase was observed (327 ± 325 mg/24 h at 60 mo). This slight increase in proteinuria could be due to gradual graft dysfunction and chronic allograft nephropathy. Calcineurin inhibitor trough levels were not significantly affected during the entire follow-up. Adverse reactions were observed in 4 patients (8.5%) and included mild gastrointestinal complaints, which were successfully treated with cinacalcet dose reduction. Cinacalcet has been extensively used for the treatment of secondary hyperparathyroidism in dialysis patients. However, its use in kidney transplant recipients remains off-label. 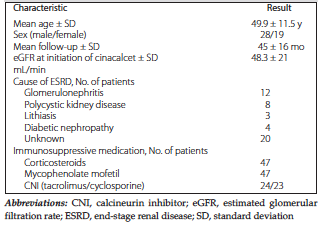 Several prospective15-30 and retrospective31-41 observational cohort studies have examined the potential effects of cinacalcet in kidney transplant recipients. Most of these studies have included small cohorts with short follow-up periods, whereas only 4 studies have reported follow-up of greater than 3 years.30,38,39,41 More recently, the first double-blind, randomized controlled trial42 with 1-year follow-up compared cinacalcet versus placebo in kidney transplant recipients with persistent secondary hyper-parathyroidism. The observed effects of cinacalcet, however, come at the cost of an increase in drug dosing, as mean dose almost doubled toward the end of the observation period. Despite early restoration of normocalcemia at 12 months, which was the primary therapeutic target, cinacalcet dose continued to increase during the entire follow-up. This indicates that continuous uptitration of cinacalcet is needed to achieve a sustainable effect on serum calcium, thus substantially increasing the costs of a long-term treatment. With regard to graft function, stable eGFR and a slight, nonsignificant increase in mean urinary protein excretion throughout the whole follow-up indicated that treatment with cinacalcet did not significantly affect graft function. Available studies have shown contradicting results, as some have reported worsened graft function after treatment with cinacalcet,20,27,29,36 whereas others have shown improved22,35,37 or stable graft function.41 We also did not observe any perturbations in calcineurin inhibitor trough levels, and the immunosuppressive regimen was not changed in any of the patients for reasons related to the use of cinacalcet or after initiation of the drug. Major adverse events were not observed throughout the follow-up, and the drug was not discontinued in any patient due to adverse events. Mild gastrointestinal symptoms were observed in 8.5% of patients. In 2 patients, gastrointestinal discomfort was more severe but was relieved after dose reduction. These observations point toward a good safety profile of the drug; however, they cannot be generalized as the study cohort was small. Limitations of this study include the small number of patients and the observational cohort design, which renders it vulnerable to selection bias. The lack of a control group (we had no comparison groups of patients treated with placebo, conventional treatment, or parathyroidectomy) significantly limited the robustness and generalizability of our results. Furthermore, an important limitation of this and all other relevant studies published so far is the use of surrogate endpoints. Thus, it is unknown whether the observed biochemical effects of treatment of cinacalcet can have a positive impact on hard outcomes such as bone fracture risk, vascular calcifications, or cardiovascular mortality in kidney transplant recipients. In contrast, results from the EVOLVE trial43 in dialysis patients have not shown a benefit of treatment with cinacalcet on cardiovascular risk of death or major cardiovascular events. Finally, treatment with cinacalcet has been con-sidered as an alternative to surgical parathyroidectomy or as an option for delaying parathyroidectomy. However, it remains uncertain whether delaying or avoiding parathyroidectomy confers a clinical benefit to the patient. Recently, a small randomized study has demonstrated parathyroidectomy to be superior to the use of cinacalcet for treating hypercalcemia in kidney transplant recipients with secondary hyper-parathyroidism.44 Moreover, the cost-effectiveness of long-term treatment with cinacalcet has to be weighed against that of surgical parathyroidectomy. In conclusion, the present study has shown that long-term treatment with cinacalcet is effective in controlling hypercalcemia and correcting hypo-phosphatemia in kidney transplant recipients with secondary hyperparathyroidism, without signifi-cantly affecting graft function and while being well-tolerated by most patients. However, in light of recent evidence showing that cinacalcet may not improve hard outcomes and may not be superior to parathyroidectomy in kidney transplant recipients with secondary hyperparathyroidism, there is a need for adequately powered, well-designed randomized controlled trials with long-term follow-up to compare these 2 treatment options. 1. Torres A, Rodriguez AP, Concepcion MT, et al. Parathyroid function in long-term renal transplant patients: importance of pre-transplant PTH concentrations. Nephrol Dial Transplant. 1998;13 Suppl 3:94-97. Dumoulin G, Hory B, Nguyen NU, et al. No trend toward a spontaneous improvement of hyperparathyroidism and high bone turnover in normocalcemic long-term renal transplant recipients. Am J Kidney Dis. 1997;29(5):746-753. Evenepoel P, Claes K, Kuypers D, Maes B, Bammens B, Vanrenterghem Y. Natural history of parathyroid function and calcium metabolism after kidney transplantation: a single-centre study. Nephrol Dial Transplant. 2004;19(5):1281-1287. Messa P, Sindici C, Cannella G, et al. Persistent secondary hyperparathyroidism after renal transplantation. Kidney Int. 1998;54(5):1704-1713. Torres A, Lorenzo V, Salido E. Calcium metabolism and skeletal problems after transplantation. J Am Soc Nephrol. 2002;13(2):551-558. Ambühl PM, Meier D, Wolf B, Dydak U, Boesiger P, Binswanger U. Metabolic aspects of phosphate replacement therapy for hypophosphatemia after renal transplantation: impact on muscular phosphate content, mineral metabolism, and acid/base homeostasis. Am J Kidney Dis. 1999;34(5):875-883. Green J, Debby H, Lederer E, Levi M, Zajicek HK, Bick T. Evidence for a PTH-independent humoral mechanism in post-transplant hypophosphatemia and phosphaturia. Kidney Int. 2001;60(3):1182-1196. O'Shaughnessy EA, Dahl DC, Smith CL, Kasiske BL. Risk factors for fractures in kidney transplantation. Transplantation. 2002;74(3):362-366. Gwinner W, Suppa S, Mengel M, et al. Early calcification of renal allografts detected by protocol biopsies: causes and clinical implications. Am J Transplant. 2005;5(8):1934-1941. Mazzaferro S, Pasquali M, Taggi F, et al. Progression of coronary artery calcification in renal transplantation and the role of secondary hyperparathyroidism and inflammation. Clin J Am Soc Nephrol. 2009;4(3):685-690. EBPG Expert Group on Renal Transplantation. European best practice guidelines for renal transplantation. Section IV: Long-term management of the transplant recipient. IV.8. Bone disease. Nephrol Dial Transplant. 2002;17 Suppl 4:43-48. Rodriguez M, Nemeth E, Martin D. The calcium-sensing receptor: a key factor in the pathogenesis of secondary hyperparathyroidism. Am J Physiol Renal Physiol. 2005;288(2):F253-264. Lindberg JS, Moe SM, Goodman WG, et al. The calcimimetic AMG 073 reduces parathyroid hormone and calcium x phosphorus in secondary hyperparathyroidism. Kidney Int. 2003;63(1):248-254. Borchhardt KA, Heinzl H, Mayerwoger E, Horl WH, Haas M, Sunder-Plassmann G. Cinacalcet increases calcium excretion in hypercalcemic hyperparathyroidism after kidney transplantation. Transplantation. 2008;86(7):919-924. Borchhardt KA, Diarra D, Sulzbacher I, Benesch T, Haas M, Sunder-Plassmann G. Cinacalcet decreases bone formation rate in hypercalcemic hyperparathyroidism after kidney transplantation. Am J Nephrol. 2010;31(6):482-489. Schwarz A, Merkel S, Leitolf H, Haller H. The effect of cinacalcet on bone remodeling and renal function in transplant patients with persistent hyperparathyroidism. Transplantation. 2011;91(5):560-565. Guerra R, Auyanet I, Fernandez EJ, et al. Hypercalcemia secondary to persistent hyperparathyroidism in kidney transplant patients: analysis after a year with cinacalcet. J Nephrol. 2011;24(1):78-82. Borstnar S, Erzen B, Gmeiner Stopar T, et al. Treatment of hyperparathyroidism with cinacalcet in kidney transplant recipients. Transplant Proc. 2010;42(10):4078-4082. Toro Prieto FJ, Bernal Blanco G, Navarro Garcia M, et al. Calcimimetics and bone mineral density in renal transplant patients with persistent secondary hyperparathyroidism. Transplant Proc. 2009;41(6):2144-2147. Lopez V, Toledo R, Sola E, et al. Treatment with cinacalcet in 29 kidney transplant patients with persistent hyperparathyroidism. Transplant Proc. 2009;41(6):2394-2395. Carrasco FR, Perez-Flores I, Calvo N, Ridao N, Sanchez A, Barrientos. Treatment of persistent hyperparathyroidism in renal transplant patients with cinacalcet improves control of blood pressure. Transplant Proc. 2009;41(6):2385-2387. Kamar N, Gennero I, Spataru L, et al. Pharmacodynamic effects of cinacalcet after kidney transplantation: once- versus twice-daily dose. Nephrol Dial Transplant. 2008;23(11):3720-3726. Bergua C, Torregrosa JV, Fuster D, Gutierrez-Dalmau A, Oppenheimer F, Campistol JM. Effect of cinacalcet on hypercalcemia and bone mineral density in renal transplanted patients with secondary hyperparathyroidism. Transplantation. 2008;86(3):413-417. Serra AL, Savoca R, Huber AR, et al. Effective control of persistent hyperparathyroidism with cinacalcet in renal allograft recipients. Nephrol Dial Transplant. 2007;22(2):577-583. Szwarc I, Argiles A, Garrigue V, et al. Cinacalcet chloride is efficient and safe in renal transplant recipients with posttransplant hyperparathyroidism. Transplantation. 2006;82(5):675-680. Apostolou T, Kollia K, Damianou L, et al. Hypercalcemia due to resistant hyperparathyroidism in renal transplant patients treated with the calcimimetic agent cinacalcet. Transplant Proc. 2006;38(10):3514-3516. Kruse AE, Eisenberger U, Frey FJ, Mohaupt MG. The calcimimetic cinacalcet normalizes serum calcium in renal transplant patients with persistent hyperparathyroidism. Nephrol Dial Transplant. 2005;20(7):1311-1314. Courbebaisse M, Diet C, Timsit MO, et al. Effects of cinacalcet in renal transplant patients with hyperparathyroidism. Am J Nephrol. 2012;35(4):341-348. Paschoalin RP, Torregrosa JV, Barros X, Duran CE, Campistol JM. Cinacalcet de novo in persistent hypercalcemia after kidney transplantation secondary to hyperparathyroidism: long-term follow-up and effect of withdrawal. Transplant Proc. 2012;44(8):2376-2378. Pinho LR, Ribeiro Santos MJ, Pestana Vasconcelos M. Cinacalcet in the treatment of persistent hyperparathyroidism after kidney transplantation. Clin Nephrol. 2011;75(3):263-268. Copley JB, Germain M, Stern L, et al. Evaluation of cinacalcet HCl treatment after kidney transplantation. Transplant Proc. 2010;42(7):2503-2508. Gomez Marques G, Obrador Mulet A, Vilar Gimeno A, et al. Treatment with cinacalcet of secondary hyperparathyroidism after renal transplantation. Transplant Proc. 2009;41(6):2139-2143. El-Amm JM, Doshi MD, Singh A, et al. Preliminary experience with cinacalcet use in persistent secondary hyperparathyroidism after kidney transplantation. Transplantation. 2007;83(5):546-549. Leca N, Laftavi M, Gundroo A, et al. Early and severe hyperparathyroidism associated with hypercalcemia after renal transplant treated with cinacalcet. Am J Transplant. 2006;6(10):2391-2395. Srinivas TR, Schold JD, Womer KL, et al. Improvement in hypercalcemia with cinacalcet after kidney transplantation. Clin J Am Soc Nephrol. 2006;1(2):323-326. Cho ME, Duan Z, Chamberlain CE, Reynolds JC, Ring MS, Mannon RB. Cinacalcet improves bone density in post-kidney transplant hyperparathyroidism. Transplant Proc. 2010;42(9):3554-3558. Paschoalin RP, Torregrosa JV, Sanchez-Escuredo A, Barros X, Duran CE, Campistol JM. Cinacalcet treatment for stable kidney transplantation patients with hypercalcemia due to persistent secondary hyperparathyroidism: a long-term follow-up. Transplant Proc. 2012;44(9):2588-2589. Torregrosa JV, Morales E, Diaz JM, et al. Cinacalcet for hypercalcaemic secondary hyperparathyroidism after renal transplantation: a multicentre, retrospective, 3-year study. Nephrology (Carlton). 2014;19(2):84-93. Yang RL, Freeman K, Reinke CE, et al. Tertiary hyperparathyroidism in kidney transplant recipients: characteristics of patients selected for different treatment strategies. Transplantation. 2012;94(1):70-76. Thiem U, Gessl A, Borchhardt K. Long-term clinical practice experience with cinacalcet for treatment of hypercalcemic hyperparathyroidism after kidney transplantation. Biomed Res Int. 2015;2015:292654. Evenepoel P, Cooper K, Holdaas H, et al. A randomized study evaluating cinacalcet to treat hypercalcemia in renal transplant recipients with persistent hyperparathyroidism. Am J Transplant. 2014;14(11):2545-2555. Investigators ET, Chertow GM, Block GA, et al. Effect of cinacalcet on cardiovascular disease in patients undergoing dialysis. N Engl J Med. 2012;367(26):2482-2494. Cruzado JM, Moreno P, Torregrosa JV, et al. A randomized study comparing parathyroidectomy with cinacalcet for treating hypercalcemia in kidney allograft recipients with hyperparathyroidism. J Am Soc Nephrol. 2016;27(8):2487-2494. Acknowledgements: The authors have no conflicts of interest or funding to disclose.